By David Ponce on 04/26/16 • Leave a comment! Yes, we know, waking up is hard. There’s an entire eco-system built around providing you with an endless array of options to get yourself out of bed in the morning. But there’s something really interesting about the Shock Clock. 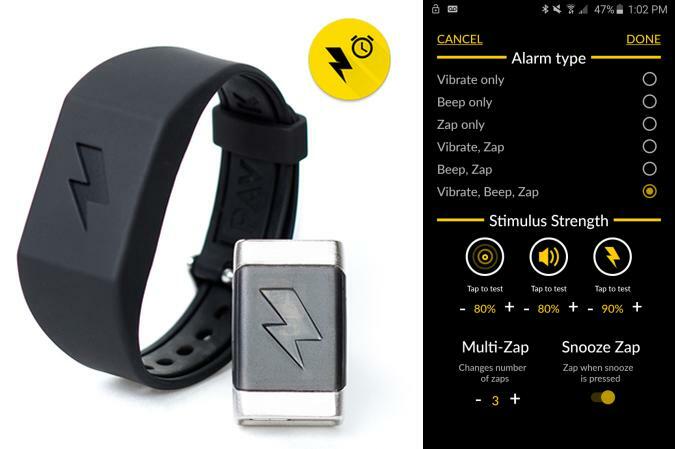 It’s a little bracelet you wear to bed, and when it’s time to get up, it does three things: first it gently vibrates, then if that’s not enough, it starts to make an audible alarm sound… and then, if you’re still lazing around, it gives you a harmless but potentially painful electric shock. 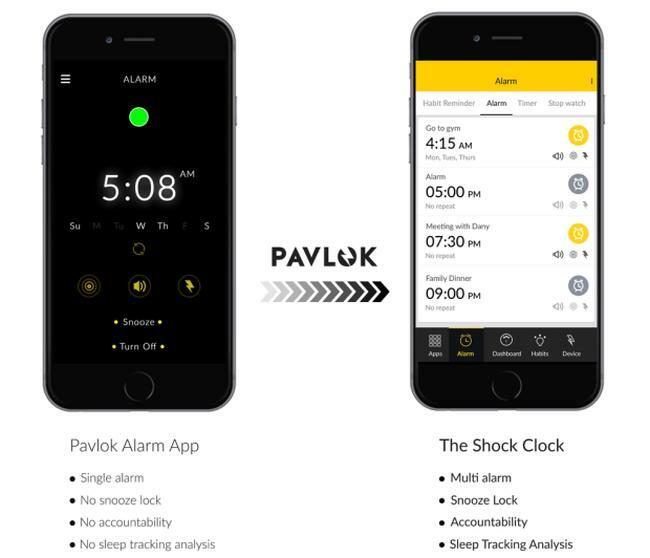 After some nights, your mind starts to associate the vibration and audible alarm with an upcoming shock, and you’ll presumably make efforts to get up before that happens. The features don’t end there. There’s a Snooze Lock setting that prevents you from snoozing; the only way to turn the alarm off is to get up and walk around, leaving it up to the motion sensors to determine you’re actually awake. Additionally, there’s an Accountability Feature that lets your friends zap you remotely should you fail to wake yourself up. Granted, nothing stops you from simply removing the thing from your wrist in the morning, but at some point if you don’t want to be helped, well… It’s $99, with a May 2016 expected delivery date. By David Ponce on 03/31/16 • Leave a comment! 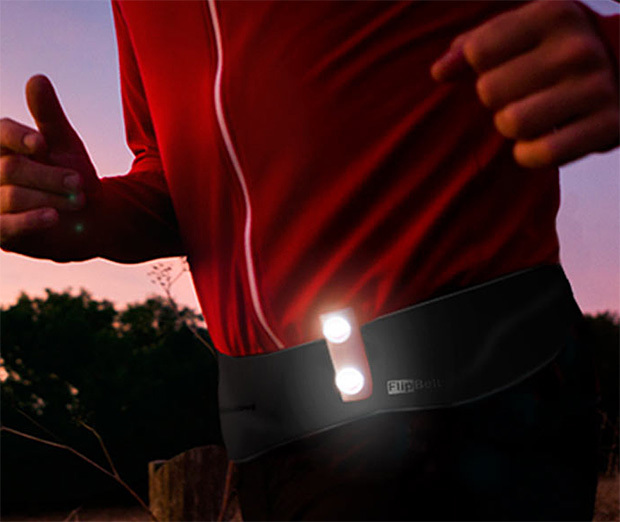 Runners need to be seen at night. There’s a slew of LED lights on the market to help them with this, but the Million Mile Light stands out by requiring absolutely no battery, ever. It uses the kinetic energy from your every stride to power a pulsating LED light that’s bright enough to be seen up to 200m away. The IPX4 rating means it’s completely weatherproof and splashproof, and best of all, it costs all of $23. The world of wearable tech continues to develop in interesting ways. One of which is that it is actually becoming more fashionable. Note that we said fashionable, not trendy – just because something is trending does not automatically make it fashionable. Where most wearable devices up until now were produced by tech companies attempting to create devices for market consumption that went beyond mobiles, it seems that the fashion industry itself is beginning to jump on the tech band wagon, producing wearable tech that is actually wearable! Fossil is a well-known brand for watches first and foremost, although they have also created quite a name for themselves within the bags and accessories sector as well. Ultimately, when considering anything from Fossil, one considers something of style and quality. So with Fossil dipping their feet into the tech sector, the result has been a production of wearable devices that are actually attractive and fashion-forward. And it doesn’t seem to be stopping any time soon, since Fossil Group has recently acquired tech company Misfit for the hefty investment of $260 million. With this partnership, Fossil is poised to innovatively expand their wearable tech product line and establish themselves even further as one of the bigger competitors on the market. Another company that has perfected the fashion-meets-tech dilemma that has left other companies baffled is luxury watch brand Tag Heuer. 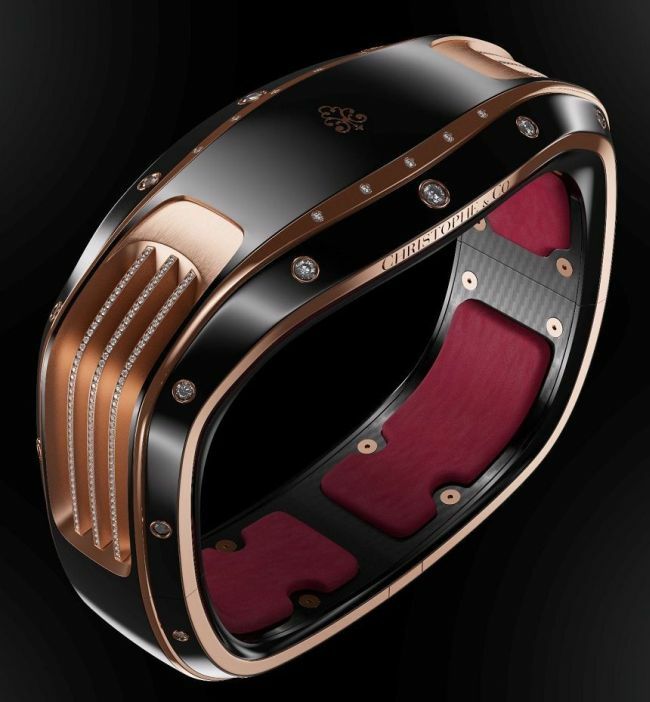 Tag Heuer has collaborated with even bigger tech industry geniuses Google and Intel to produce the exceptional Connected Watch. 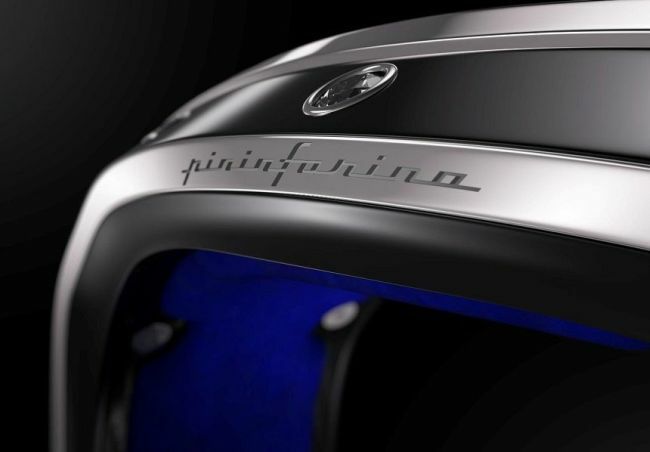 The Connected is based on their previously successful Carrera collection design, and is perhaps the nicest looking smartwatch on the market, although there is some concern over the price tag, which currently sits at $1,500. 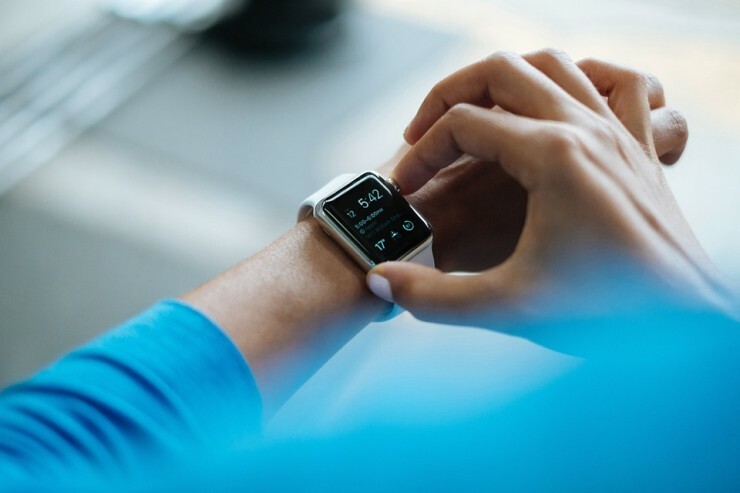 The Connected moves wearable tech out of the realm of a sportswear accessory – like Moov is marketed as – and into the realm of a smartwatch that can actually complement a business suit, or whatever other looks you might be going for when wearing a luxury watch. Only time will tell where smartwatches and wearable tech is going to from here, but as far as we can see on this increasingly visually appealing horizon, the future is indeed looking up. By David Ponce on 06/08/15 • Leave a comment! So… this exists. 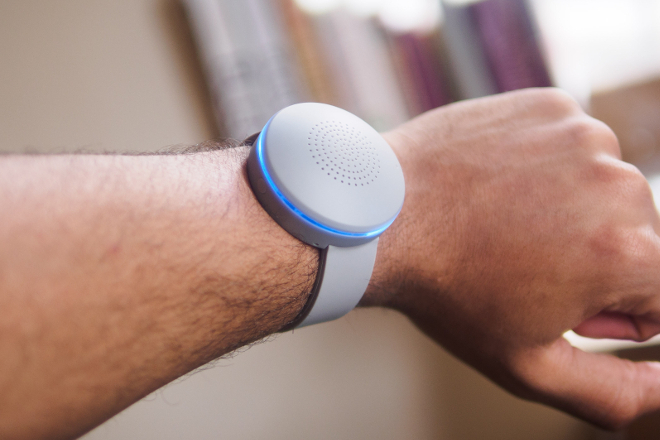 It’s a Bluetooth speaker, and it sits on your wrist. You can either stream music to it, or take calls. But you can’t make any because there’s only one button, and all it does is turn the device on and off, and accept incoming calls. It’s big. It’s bulky. And you’d be right in asking who in their right mind would ever want one. But Chris Davies from Slashgear makes a good point: what about grandmothers? We like to evaluate products from our own standpoints where a big, bulky boombox-on-a-wrist is stupid, but for someone with limited mobility, for whom the phone that’s ringing in the adjacent room is probably too long a trek to bother with, well, it makes a little more sense. Considering it’s $20, and probably easier to use than a pair of scissors, the WristBoom seems like just the kind of thing you’d get for someone like grandma. That’s of course if it ever does see the light of day, which seems unlikely considering their crowdfunding campaign appears dead in the water for now. Still, there are 10 days left, and you never know what can happen in that span of time. By David Ponce on 03/27/15 • Leave a comment! Haven’t you heard? The Apple Watch is nigh! Hordes of people are getting ready to plunk down anywhere from $349 to $10,000 to own Cupertino’s first wearable, and to be honest… we won’t be one of them. We were happy enough not to need a watch anymore, once phones made them obsolete, that we’re not about to pay extra for redundant tech. But hey, we don’t judge. 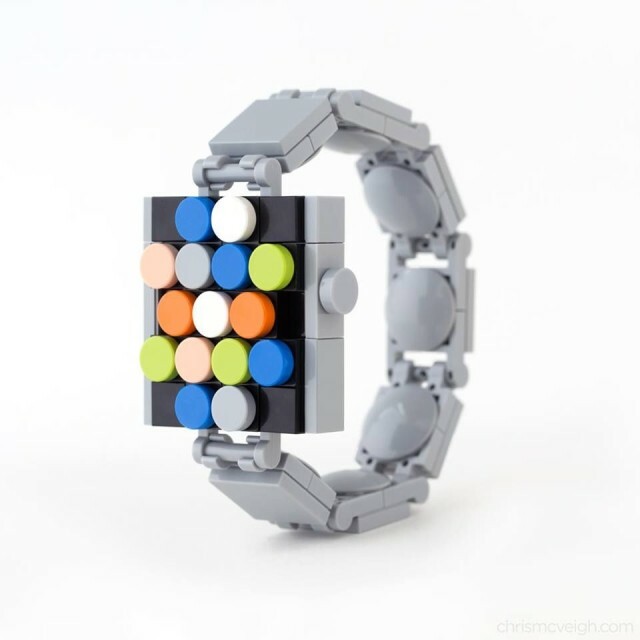 If you want to get in on the action, on the cheap, you could always spend some time building the above LEGO Apple Watch. Master LEGO builder Chris McVeigh has posted a very detailed and exhaustive document detailing exactly how you can make your own. With a bit of patience, and the right LEGO pieces, you’ll be able to wear… some sort of statement on your wrist. By David Ponce on 01/22/15 • Leave a comment! Modularity is all the rage these days. Just look at the excitement over Project Ara, the modular smartphone, for proof. And why shouldn’t it be? Modular gadgets mean that we can reconfigure them to our liking, adding more of the hardware elements that we want, and less of the ones we don’t care about. 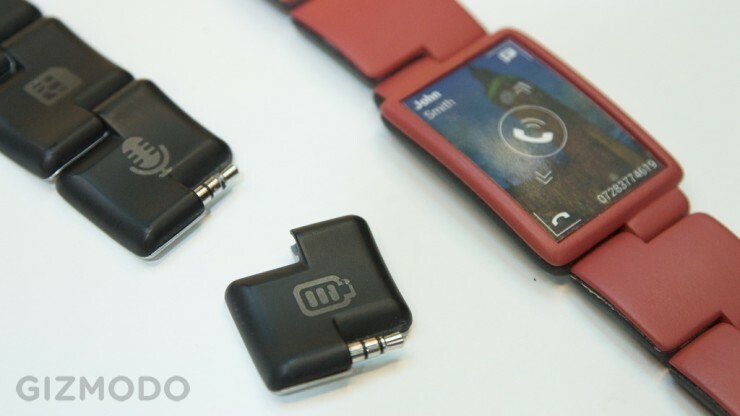 Blocks, the modular smart watch being discussed in this article, is a project by the same people who were initially behind Project Ara, before Google got involved. They’re now trying the same approach with a timepiece where each link in the wristband can be a different hardware component. Modules can be dedicated extra batteries, GPS chips, contactless payments, SIM cards, and even heart-rate monitors. 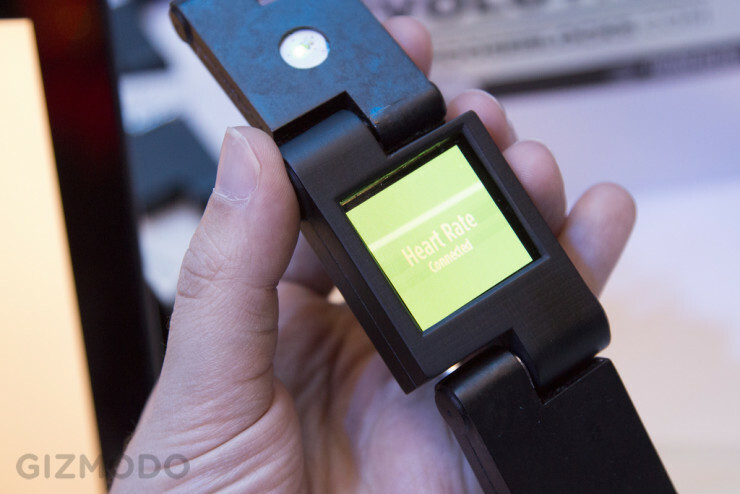 Don’t care about heart-rate monitoring? Swap that link for an extra battery! It’s a great idea, but the success will depend on execution. Early prototypes, as shown in these pictures, look chunky and unattractive. The team is planning a Kickstarter for Q2 2015, so hopefully by then they’ll have refined their hardware enough to make it visually attractive. Pricing starts at $150 for the watch face itself, plus $20-$40 for each module. If you want the whole thing decked out, you’d be looking at $330. By David Ponce on 11/03/14 • Leave a comment! Yeah, we’re polluting this planet, alright. Whether our politicians will ever get their act together remains to be seen, but that doesn’t mean individuals and companies can’t do anything in the meantime. And considering how bad things are getting in China, it’s no surprise to see the above Wearable Air Purifier come out of there. 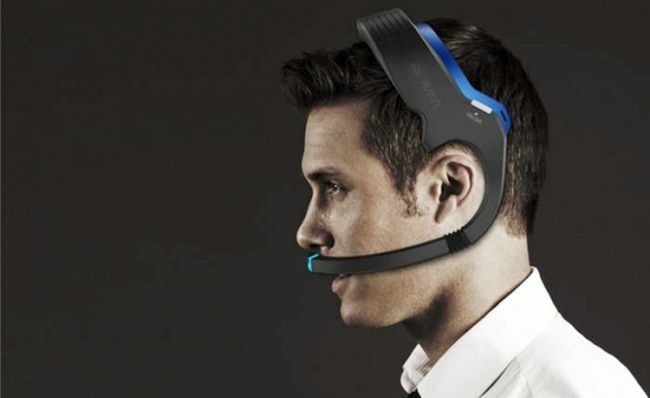 It’s a strange looking contraction that you wear on your head, like a futuristic headset, but whose entire purpose is to attempt to purify the air you breathe. It draws dirty atmosphere through the upper section and funnels it through filters and electrostatic dust removal panels before directing it right under your nose. The air, once cleaned, is 99.9% free of contaminants. Sensors keep track of how hard they’ve had to work, providing your smartphone with a map of your city’s dirtiest areas. You also get data on temperature, humidity, CO2 levels and more. Currently the device’s battery life stands at 6-8 hours, but there are plans to increase that to 10 hours. It’s not available yet, but the company is seeking funding to bring it to market. By David Ponce on 03/13/14 • Leave a comment! Wearables are all the rage these days, from smartwatches to life logging devices, there’s something for everyone. So why should your dog feel left out? The Whistle Activity Monitor is like a Fitbit for your canine companion. 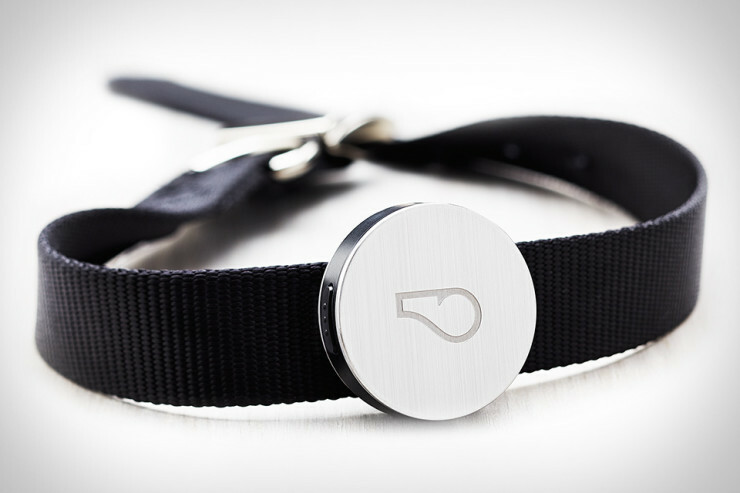 It tracks your dog’s every movement and feeds it back to your through a smartphone app. This way you can know if he’s getting enough exercise, enough playtime, and enough rest.